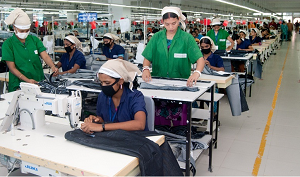 Ready made garment industry is highly labour intensive. Hence labour cost per hour is an important factor in this sector to remain competitive. As per the global Statistics & data available, it reveals that labour cost per hour in India is substantially lower than the developed and developing countries in the world. However, there are few under developing/developing countries in Asia, where labour cost is lower than India. Countries like Vietnam & Cambodia with lower labor cost are slowly making an inroad in the global market and the progress is very fast. It is a fact that labour cost per hour simply does not indicate the impact on garment manufacturing cost. It also depends on value addition made by the individual per hour. It is reported that though labour cost is high in some countries but value addition made by a labor, is substantially higher compared to other countries including India. Unfortunately, this did not happen in our country in absence of appropriate plan & initiative, though, Indian workforce has a good skill & knowledge. As per my knowledge, there are a few industries in NCR & Mumbai, who have framed strategic plan to motivate and encourage the workforce to enhance value addition in productivity. Hence; India should make appropriate initiatives to make this advantageous position in favor, to accrue the more benefit by maintaining the higher ratio between labour cost per hour and value addition made by the individual per hour. Chandan Saha is currently holding the position of Joint Advisor (CI), Planning Commission, New Delhi, India. He is a Fellow of Institution of Engineers India and Life member of various professional associations. He was engaged in R&D works for long. He has received Er. Sadanand Memorial Award from Institution of Engineers India, Orissa Circle for the significant contribution in the development of industry in the state of Orissa. He was dealing with WTO related issues, Trade Agreement in connection to International Trade Development. He has presented Technical Papers in National and International Seminars and he has 60 published technical papers on his credit. Labor cost, labor cost comparison of different countries making garments.